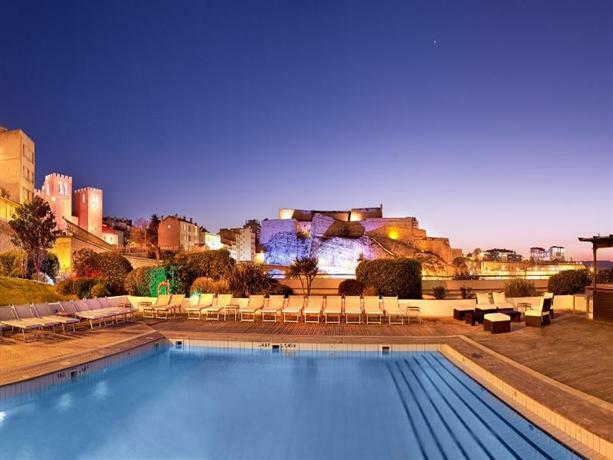 Located at the top of the Radisson Blu Marseille the rooftop pool overlooks the Marseille cityscape, the Citadel Saint-Nicolas, and the Abbey of Saint Victor. Surrounded by sculpted gardens, the outdoor pool is 4.5 feet deep and features chaise loungers, over-sized sun umbrellas, solarium, and a pool side bar known as Le Blu Square. Le Blu Square serves a variety of cocktails, wine, and beer, as well as a menu of grilled meats and signature desserts.